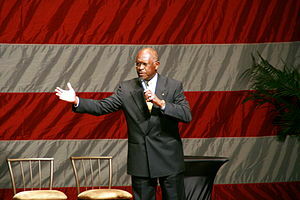 I have seen Herman Cain in person on two separate occasions and both times he was great! He is very outspoken, even charming. He will gladly autograph anything you give him to sign and basically as many items as you would like if he has the time. Is he a legitimate presidential candidate? Who knows for sure? I can tell you he is great for autographs! This entry was posted in Uncategorized and tagged Fox Business, Georgia Senate, Hermanator's Intelligent Thinkers Movement, HITM, News Talk 750 WSB, North Star Writers Group, Tea Party. Bookmark the permalink.